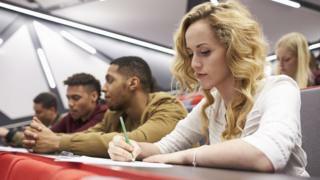 Tuition fees in England are under intense scrutiny - with a huge amount of confusion about what is going to happen next. They're meant to be increased even further - but there is a feeding frenzy of briefings suggesting that they are more likely to be reduced. It's a case of the politics of a minority government - and competing power bases - becoming more important than policy. No one wants to be left holding an unpopular policy when the music stops - and Downing Street and the Treasury, as well as education ministers, will want a fee system that is more attractive to voters. Students are already applying for these courses, but such is the political vacuum that no one can tell them how much it will cost. Sources within higher education are less vague. They say that the planned increase is "dead in the water" or "one for the birds" and universities are working on the assumption that fees will not be raised above £9,250. This would be the first real climbdown on raising fees since they were introduced in the 1990s. But with no government majority in the Commons and no political appetite for a fight for higher fees, putting on the brakes could be a case of not "if" but "when". 2) Lower fees: Or this could be called "Doing a Miliband", which in this context would not be seen as auguring well. After a big build-up in the 2015 election, Labour leader Ed Miliband announced a policy that fees would not be scrapped but reduced to £6,000. This middle way pleased no one. But it seems to be one of the kites being flown again. The idea of fees being pitched lower than £9,250 has an initial political attraction in that it is a clear reduction in the headline figure. But would the government then be expected to pay universities for the lost revenue from fees? And if this includes a series of additional top-ups for particular subjects and differential pricing based on potential student earnings, it all gets complicated very quickly. Reduced income would mean fewer places, which is likely to mean fewer students from disadvantaged families. But universities are very much on the back foot at the moment, not really commanding much public sympathy and pushed into the corner over vice-chancellors' pay. They will fear a political calculation which would say that slashing university income would be a price worth paying for pushing down fees. 3) Lower the interest rates: The interest rates for repaying student debt has just gone up to 6.1%, often described in the technical language of finance as "eye-watering". This is based on inflation plus 3%. Quite why it has to have the 3% on top has never really been fully explained. But there has been much cross-party unhappiness with rates that seem disproportionately high. Image caption Should students on different courses pay different levels of fee? Cutting rates would be seen as popular with students and their parents. But reducing interest charges would also raise questions about another big part of the plan for student finance - that the government wants to sell off students' debts to private investors. All these factors are interlocking. 4) Raise the repayment threshold: Admittedly not the most exciting phrase in the English language. But in many ways this would be among the most quietly significant changes. Students start paying back on salaries above £21,000, a threshold that has not changed since 2012. Moving this upwards or linking it to inflation would mean stopping the upward creep in the slice of earnings going into repayments. But it's complicated and doesn't deliver short-term headlines for politicians wanting to calm unease about levels of debt. 5) Scrap the whole thing and start again: Labour, the Lib Dems and the Conservatives have all had their fingers burned by fees. And there have been rumblings about some kind of commission or major review to look again at whether there is a better way of funding higher education. As well as Labour's proposal to pay for fees through taxation, there have been suggestions of turning it into a graduate tax, with the political attraction of getting rid of any headline figures for fees and debts. No one sees the income tax they will pay in the future as "debt". Longer term, universities will be looking even harder at independent funding. Their academic autonomy sits increasingly uneasily alongside their financial dependency. Relying on rising fees means accepting each new set of hoops from incoming ministers. A year ago, universities thought they were climbing aboard a system of fees that would increase every year, giving them financial stability. Now it looks as though they might have stepped on to a trapdoor.